Our recent post about the rise of Japanese cuisine prompted comments from our members about how much they love Sake, but how little they knew about it. We are doing some research therefore as our own knowledge is pretty limited of what is good and what isn’t in the complex world of rice wine so we’ll bring you a post shortly on our findings. Meantime hot Sake seems to lend itself to this very wintery weather suddenly upon us so we bring you our top 10 of our favourite hot alcoholic drinks (Sake not withstanding) and the best recipes we’ve found to make them. Let us know if you try any! For some mulled wine is a real indication that the festive season is upon us. The cinnamon spices and citrus smells conjure up images of open fires and ski lodges, carol singers and open air ice rinks. For others it’s a truly dreadful thing to do to a decent bottle of wine, or even worse a sickly sweet way of disguising a cheap bottle of plonk that is going to leave you with a raging headache. We prefer the former view and have searched to bring you the best recipe to avoid the sickly sweet version. The Guardian have tried out a few and here is their Perfect Mulled Wine. Those of you that have been lucky enough to visit the Harry Potter Studio Tour, or even better the actual Wizarding World of Harry Potter in Orlando will no doubt have tasted this mythical Beer. These are the only two places you can buy it outside of the Three Broomsticks or Hogs Head (although apparently some Wizards have been offered it in the Leaky Cauldron) and the original recipe is of course a closely guarded magical secret (not unlike Coke Cola…). Muggles the world over have been endevouring to find the perfect homemade Butter Beer recipe however and we bring you an adult version. Made with butterscotch snapps and vodka infused squirty cream (now available in the UK) we think this brew could have you flying like Quidditch Chaser! Alcoholic Butter Beer. Now we are purist when it comes to Irish Coffee and don’t want anything other than the classic, elegant recipe made with decent Irish Whisky, hot coffee, sugar and whipped cream. What we are interested in however is the method used to get the cream to definitely float on the top! Who hasn’t been embarrassed when serving a tray of coffees to guests to find one of them is starting to turn into latte? Here then we have what we think sounds like the experts method from the Barkeeper. Let us know if it works for you. Perfect Irish Coffee. Often drunk for medicinal reasons (!) as it is known to cut through a cold, hot toddies can be made with a variety of spirits. In the UK however we traditionally tend to use whisky. I associate it with Boxing Day Races at Kempton Park as it is great way to thaw out frozen fingers. If you want to see off winter chills then try this recipe from Nigel Slater. Classic Hot Toddy Recipe. Though wine is well known as being a ‘mullable’ drink, cider is not perhaps on every ones radar. Drinks have been mulled for centuries though and cider makes a great base for a seasonal warming punch. What better way to celebrate autumn becoming winter than warming up the authentic taste of the english orchard with cloves and cinnamon (and in this recipe a slug of sloe gin!). Mulled Cider. Allegedly invented by sailors, legend has it that the British Navy added lime to their Rum to prevent it going off and protect themselves from scurvy. Soon after the import of molasses to America, colonists started distilling rum and adding spices. It would appear they didn’t stop at spices though, mixing in egg whites, milk, cream and finally butter. Of all these concoctions butter is the one to have continued to be mixed with hot rum but we have struggled and failed to find a reason? Whatever the reason it works terribly well and the rich syrupy mix is like a hug in a glass. We were particularly intrigued by this recipe as it features a red hot poker…! Hot Buttered Rum Recipe. Now there are many alcoholic hot choc recipes out there but we were more interested in the ones that you find ‘apres-ski’ which involve Chartreuse. Named the ‘Elixir of Long Life’ Chartreuse is a French liqueur made by the Carthusian Monks since 1737 according to the instructions set out in the secret manuscript given to them by François Annibal d’Estrées in 1605. Now you know. It is known to have an ‘assertive’ flavour and just a few drop are sufficient as its is aged with 130 herbs and plants. It is known to work excellently well with chocolate – but it has to be excellent quality drinking choc or the result will be overly sweet. Sit back, close your eyes and think of the slopes! Verte Chaud. Vodka. Tea. What do they have in common you say? Well independently they have both been infused with pretty much every flavour known to man. Why never together? Well now they have. Absolut have released a ‘Wild Tea Vodka’ and infusers have gone equally wild for it! Two Leaves Tea Company have been experimenting and we think their Sunday Tea Cocktail sounds divine. Definitely one to watch as they talk also of sake with tea – wow! Vodka Tea Recipes. 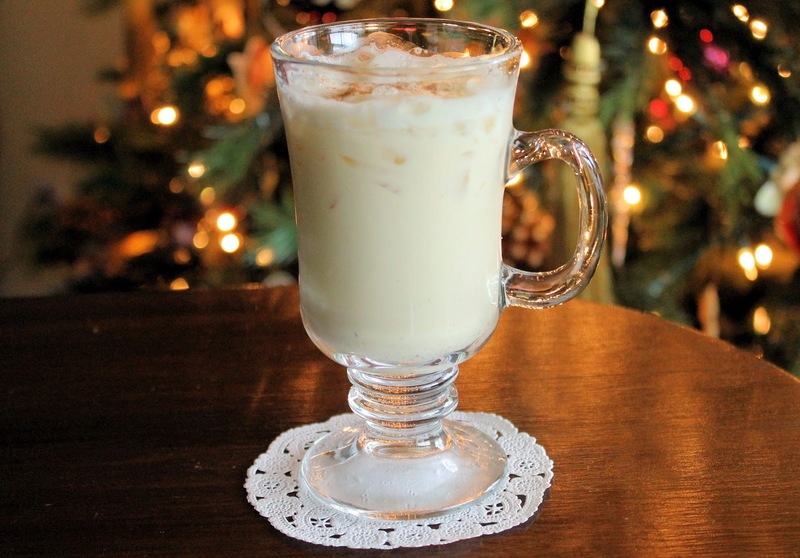 Christmas doesn’t get more traditional than this milky sweetened drink, once much favoured by the British aristocracy. Nog is an old English dialect word of obscure origins that was used to describe a kind of strong beer (hence noggin). The America’s picked it up and it became equally as popular, consumed at Thanks Giving. It would seem that everyone now has a recipe for the perfect Egg Nog, some with rum, some with brandy but all with nutmeg. We particularly like this recipe from ‘Natalies Mom’ (which we think makes her American). Amazingly Good Egg Nog. Gin is appealing to a new generation right now and they are drinking it in ways that the strictly Gordon’s and Tonic brigade would never approve of! Hendricks have long been associated with Gin drinkers who like something a little adventurous and possibly more complex. No longer are they simply suggesting you add cucumber as a garnish instead of lemon. This recipe takes Hendricks as a base and adds fruit and spices and maderia wine to make a spicy punch that would kick off any Christmas party and keeping it going till New Year! Hendricks Hot Gin Punch. If you try any of these and they work we’d love to try them – do deliver them to us at the office – in a thermos! The best Christmas Card for 2013? A Design Restaurants Card of course! Go towww.designrestaurants.com to join now and enjoy the season by dining in some of the best restaurants in the country – complimentary!